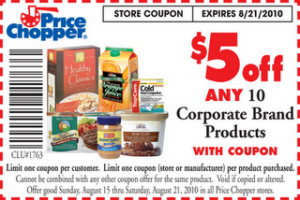 Fans of Price Chopper on Facebook can print this awesome $5/10 Price Chopper Store Brand Items coupon right now. This coupon is valid through August 21st and can score you FREE groceries at Price Chopper! Previous Post: « Bob Evans: FREE Kids Meal on Their Birthday!